Take a listen to a couple of the songs from the nine Music Together® song collections and you'll discover rich, natural instrument recordings that the whole family can enjoy. Come to class and experience being together as a family, with friends, and as a part of a community. 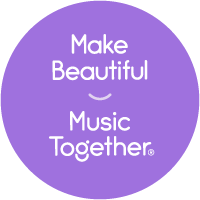 Combine music making and being together and the songs will come alive! You'll strengthen your relationship with your child, you'll make new friends, and your family will be transformed through music. Looking for even more music? Download Music Together's Hello Everybody app, and discover full length recordings, lyrics, and karaoke options! You and your toddler will become video stars! Or, better yet, sign up to try a free class today!